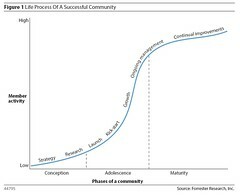 Left: One of the 5 diagrams from the report: Successful online communities experience the following stages. I spent a few months researching and preparing for this two-piece report series. I’m proud of my deliverable on Online Community Best Practices. Like a term paper, this report is based off research, interviews, insight, and data. I interviewed over 17 people (many community leaders that you know) to find out the commonalities between successful communities. Many of you are new to analyst reports, (myself included) the document is written in a very succint, actionable, and clear way, and every line is defensible , as it’s based off findings. This blog, while sometimes has elements of a report, has more opinion and topics based off my sole experience rather than the research of industry leaders. While the report is only available for Forrester clients (like your company has products, this is ours) I can share with you some findings that seem to be a problem for everyone. First of all, many companies have a hard time being successful with their community if they want to control it too tight. The most successful companies let go of the control and acted more like a host, rather than a policeman. Secondly, many companies had a hard time kick-starting a community, just because you build it, doesn’t mean they’ll come. If you’re a Forrester client, you can access the full report at the Forrester site. Please leave a comment on the site with your feedback, or on this blog. Essentially, I’m like a product manager, and I hold my customer opinions very closely, if you’ve further questions, I’d be happy to talk further. Here are some of the companies that I interviewed, ACDSee, AirTran Airways, Ant’s Eye View (Jake McKee), Avenue A | Razorfish, Carnival Cruise Lines, Charles and Helen Schwab Foundation, Cnet TechRepublic, Constant Contact, Dogster, Intuit, Leverage Software, Microsoft, MySpace.com, Organic, Reuters AdvicePoint, SATMetrics, Telligent Systems, and you’ll even note that I credited Shel Israel for his definition of communities, I spearheaded this conversation on this blog, and in twitter. Each of these folks that were interviewed will receive a copy, stay tuned for an email. Update: The report spread fast, really fast. Just a few hours after this post, one of the top German luxury car manufactures has requested a meeting today, to talk about online communities.